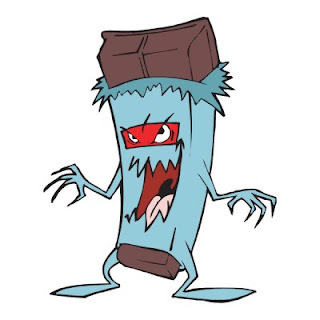 My Munchable Musings: My Munchable Soapbox: Spooktacular News for Chocolate? My Munchable Soapbox: Spooktacular News for Chocolate? Happy Halloween! Can you believe that it is the last day of the month of October, and as such the last day of the Vegan Month of Food? Crazy. But let's turn our attention to the focal point of the day - candy. Now, growing up there was nothing more exciting than an evening out collecting Twix bars, bags of Skittles, and Tootsie Pops. And I also remember despising those houses giving out boxes of raisins, pretzels, or god-forbid something inedible! I mean, who does that? Well, I was seriously considering being one of those people this year. Why? Not because I vehemently oppose the consumption of candy. Please, I live for chocolate. But rather because I have so few options for candy that I feel ethically sound giving out. And while I could go out and drop some serious cash purchasing mini chocolate bites that are organic and fair trade, kids just couldn't care less. So, stewing over this dilemma, I came across this article a co-worker sent me at the beginning of the month. Hershey to source 100% certified cocoa by 2020! But what did this mean? The certified cocoa that Heryshey co. is talking about is really a catch-all of third-party verified standards for better labor, environment, and farm outcomes. Now less than five percent of market share, certified cocoa in the hands of Hershey would be like organic in the hands of Walmart (oh wait...). This move has some precedents, as the company has already vowed all Hershey’s Bliss chocolates will be Rainforest Alliance certified and available to consumers by year end and Scharffen Berger will be 100% certified cocoa by end of 2013. Hershey-owned Dagoba organic chocolate is currently 100 percent Rainforest Alliance certified. Yet even being the skeptical environmentalist I am, this move seems to hold water! So while I won't make a habit of this, I also don't feel as guilty about serving up some Herhey's for the holiday. Check out Grist for some other thoughts. And visit the Raise the Bar campaign site to see the effort to make Hershey move towards sustainable cocoa sourcing.